With the blessing of the crib, a wealth of favourite carols for audience participation supported by a choir, nativity narration and acting, a programme of readings, poems and music with two choirs, trumpets, bells, and of course a glass of something to keep you warm. Produced by our amazingly spritely resident director Tessa Howell, with musical direction provided by the very patience and talented David Kyle. 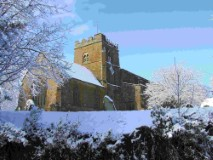 This entry was posted in Posts by Horley Views and tagged Bell Ringing, Carol Service, Carol Singing, Comunity Choir, David Kyle, Horley children, Horwell Singers, Nativity Play, St. Etheldreda’s Church, Tessa Howell on December 14, 2016 by thehorleyviews.